The Regina Pats (also known as the Patricias) played their first ever game defeating the Regina Victorias 5-2. Here is the lineup from The Morning Leader. Here is the summary from The Morning Leader. Let me introduce myself. My name is Kevin Shaw and I have been a Pats fan almost my entire life. My parents can't remember when I attended my first game, but I do know my first game as a season ticket holder was October 5, 1979 and I was 9 months old and have been hooked since. Over the course of my season tickets I have missed less than 15 home games. You could call me a die hard. At a young age I started writing Pats stats as they were announced and wrote the goals, assists and penalties on the lineups. My fascination with the Pats really got into high gear when I was 16 or 17 when I was going through an older program (1987-88 I believe it was) and I came across a published list of the ALL-TIME REGINA PATS SCORING and GOALTENDING. I think that the note at the end of the list got me going with the studying of the history of the team. It read "NOTE: Players with 30 or more games listed" but I wanted to know more. It took me a while to realize that it was just from 1966 and nothing before that. I was put in touch with Ron "Scoreboard" Johnston and he helped me get on track with stats and some other Pats things. I've now taken my stats to another level and in my last 18-19 years I've spent hours upon hours studying the Pats. In all honesty I still learn new things all the time. Hope you enjoy the read. Anything that is posted on theblueliner.com does not represent the Regina Pats Hockey Club in any way. It is solely my thoughts and opinion as well as numerous stats and old Pats information. To be honest if you don't like what is blogged here, please don't read it. Please feel free to challenge me, disagree with me or tell me that I'm off my rocker in the comments section for each post. All comments are moderated and may or may not be posted on the blog. 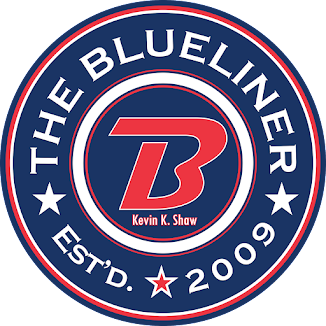 Kevin Shaw (theblueliner.com) 2009-2017. Simple theme. Powered by Blogger.